It is a long way away from here, at least for a seven-year-old. First you have to cross the town along Hämeenkatu street to the district of Kyttälä. Cut across Koskipuisto park and walk along Satakunnankatu as long as it goes. There it is, the prayer room of the Islamic Congregation of Tampere. We have come here to learn how to read and write in the Tatar language. The building no longer exists, but there is still a similar house along the street on the other side. I think it was a typical late 19th century timber-frame urban house, the plinth of granite and layers of brick, a slanting base that initially rises up as a wooden vertically trunked surface. First you climb two granite kerbstones that serve as stairs. In the winter you must be very careful here not to slip. Behind the front door you find a dark stairwell, more steep ascents. At just that point, I remember the smell. It is the smell of a wooden house, of absorbent surfaces, a bit like an archive full of old, yellowed papers, or old wallpapers partially peeling from the walls. 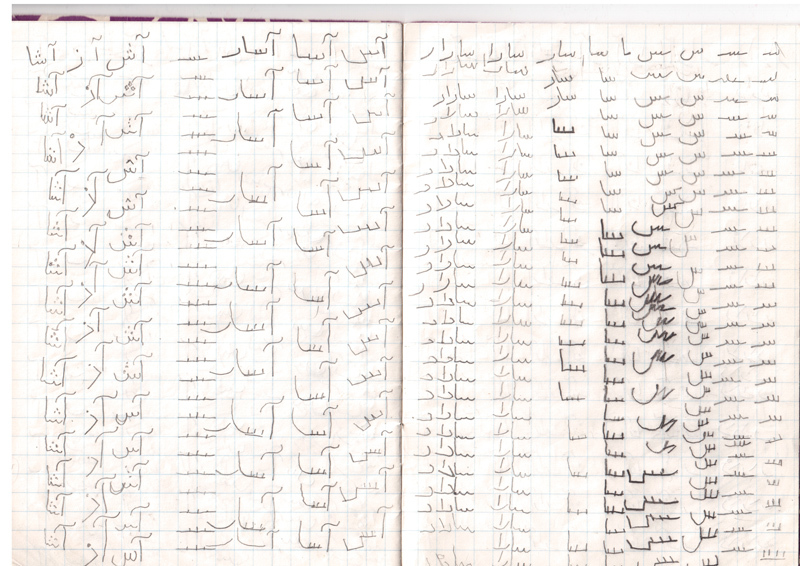 This page is from a notebook I had when I was seven and was learning to write my mother tongue, Tatar, with the Arabic script. 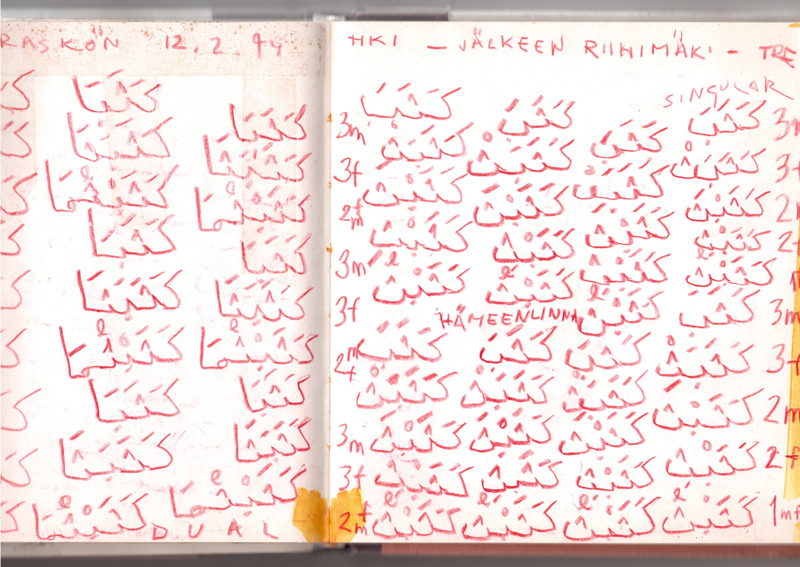 In my childhood, Arabic letters were still commonly used for writing the Tatar language. These days it is mostly written with the Latin alphabet, or with the Cyrillic in Russia. I found the notebook by chance. As I was leafing through it, my attention was drawn to one particular passage. I remember vividly my frustration and irritation in trying to master the round shapes of the Arabic letter ‘s’. I tried to copy the examples the teacher had written in my book. The ‘teeth’ of the letter were particularly difficult for me. Try as I might, I could not make the line bend in such small arcs. Finally I straightened out the round shapes and drew a straight line first, which I then divided up with small vertical lines, thus making it resemble the ‘teeth’ of the letter. The letter is usually written with a single, unbroken line, which makes for fast and smooth writing. An experienced writer makes a straight line instead of ‘teeth’. The appearance of the letter is also affected by its place within the word: the letter ‘s’ is different in the middle of a word than at the end. In writing the Tatar language, vowels are expressed differently than in Arabic, where the alphabet consists of 28 consonants. The vowels are marked with diacritics, which are often omitted, since it is assumed that the reader knows which vowel or word is in question, making it unnecessary to indicate it explicitly. Arabic is written horizontally from right to left. Compared with the Latin script it is like mirror writing. For me, being left-handed, the direction seems natural, because my hand does not cover or smudge the text I am writing. Being left-handed, I am also able to follow the pen’s movements on the paper better, because I am pulling the tip of the pen along the surface, as it were. When I write, my palm rests against the paper, I grasp the pen tight with my thumb and forefinger which are supported by the side of the middle finger. The weight rests on the edge of the palm, the thumb is perhaps more active: it almost seems to command or steer the other fingers. I imagine the area of empty paper covered by my palm as a hole which will in a moment be filled out, become meaningful due to the trace of writing. This picture is also from my notebook. It is from much later. Here I am studying Arabic, practising the conjugation of the verb ‘to write’ (kataba). At the top, I have written the date and the place. I’m in a train somewhere after Riihimäki, travelling from Helsinki to Tampere. I’m using my old method of learning based on repetition, writing a word over and over again. I’m clearly excited about the rhythm of writing, the rhythmic motion of fingers as I draw rounded lines while the train continues on in its regular rhythmic progress. I’m in a kind of an intermediary state in which linguistic meaning is in stasis, as it were. I’m able to observe the written marks on paper as shapes or figures. As I observe the written marks as figures, I also become aware of the ground. The page in my notebook turns into an infinite space or hole. I can also see the light and the shadows. I begin to trace the edges, to line the pages of the book in color.